We want you to know what others think of our facility. Here are some of our customers' comments. .... We welcome your comments as well! Rover’s Ranch is not a boarding kennel to my two mini-Aussies. It’s their second home. I’m considering making it mine. And why not? 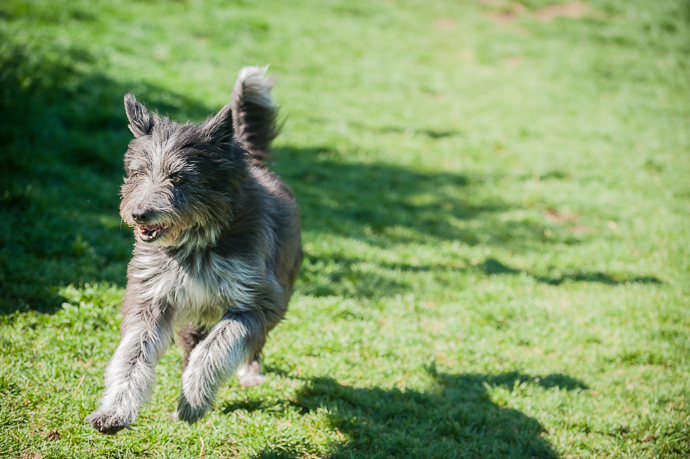 The amenities at Rover’s are incredible: Flat screen TV, spacious, air conditioned kennels, plenty of fresh air and sunshine and fun playmates. But the best part about Rovers is Patrick and Kathryn. My dogs love them. When I drop them off, they bound out of the car, tails wagging, and paw at the door to be let in. If that’s not a ringing endorsement, I don’t know what is! As the owner of two high energy dogs it can be a disconcerting experience leaving my dogs at a kennel. At some previous kennels my dogs have refused to get out of the car and when they do get rescued the kennel odor is overwhelming. Not so at Rovers Ranch! It is almost embarrassing how eager they are to jump out of the car and greet Patrick and Kathryn. And it is obvious Patrick and Kathryn are genuinely happy to see both of my dogs. It is a wonderful feeling knowing they are receiving high class treatment. Rovers Ranch earns five out of five stars! Our aging, sometimes anxious husky-shepherd mix is hard to leave with anyone else, but Patrick and Kathryn at Rover's Ranch are truly great! They are AMAZINGLY patient, understanding of canine quirks, and exceedingly friendly and easy to work with on the people side of things. And Max has apparently even picked out a favorite kennel in the new space -- which he waltzed straight into on our last visit! The "spa" - as we call it - is definitely his home away from home. Photo of Max by his owners. Rover's Ranch is the perfect place for our miniature dachshunds, Minnie and Rex. The kennels are very roomy, giving them plenty of space to stay together. Kathryn and Patrick are exceptionally skilled at dog care, and always keep Minnie and Rex safe, well cared for, and entertained. They organize play groups for the dogs by size and temperament, so Minnie and Rex actually get to play with other dogs their size (or close to it). 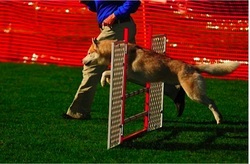 This has helped with their behavior at home and around other dogs by improving their socialization. Minnie and Rex have stayed at Rover's Ranch many times over the past few years, and now they seem excited as soon as we turn onto the road leading to the Ranch! They are always happy to see Patrick and Kathryn. I would definitely recommend Rover's Ranch to anyone, especially small dog owners! Outstanding place to take your pets! I have no concerns when I leave my dogs with Patrick and Kathryn, they have always taken care of any special needs that my pets have. Even my Police dog was given all the attention she needed while working and retired. I have always been so lucky to have be leaving them for great spa treatment - air conditioning and music or TV!! We absolutely love Rover's Ranch. Our dog has been in Patrick and Kathryn's care since she was a puppy (8 years ago) -- Patrick walked Daisy when she was a puppy in Seattle and once they moved over the mountains, we "followed" them and continue to board Daisy with them when we visit the Methow. Daisy has always come home happy and healthy and she thinks of Rover's Ranch as her home away from home! It's great to know that she gets so much love and attention when she goes for a visit and it allows us to enjoy our time away, knowing she's well cared for! Daisy gives Rover's Ranch 4 paws! Woof! Rover’s Ranch has become my dog’s second home. I travel often for my work, and Patrick and Kathryn provide a welcoming and loving environment for her when I am gone. She has made lots of friends at the Ranch and always gets excited when I turn the corner into their driveway. 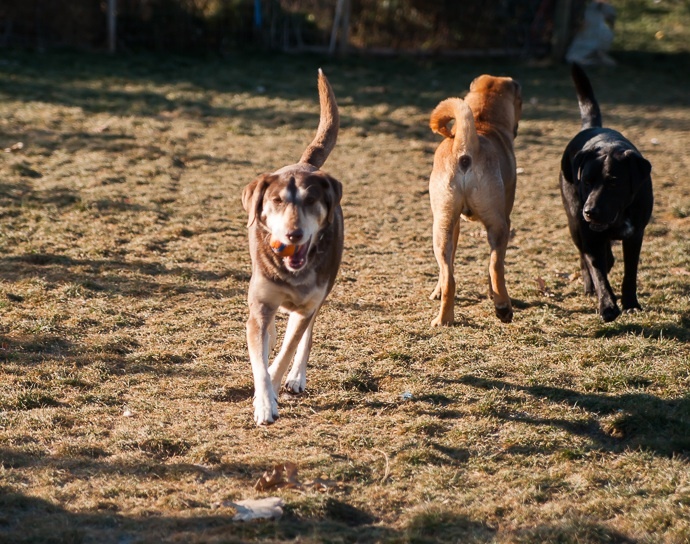 Rover’s Ranch is more than a kennel – it is a great place to be a dog ! 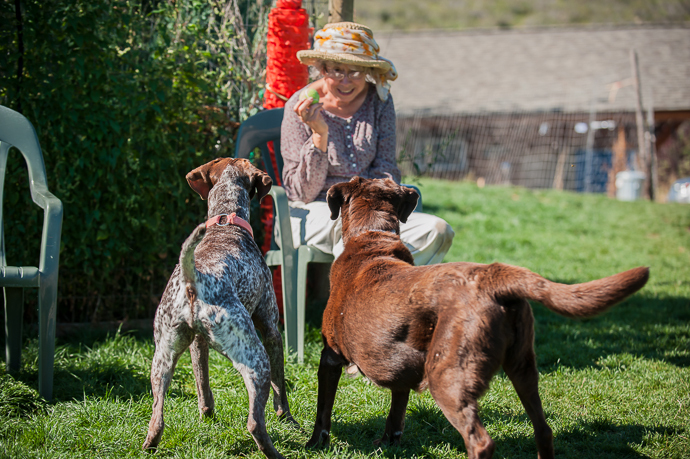 Our dogs have been guests at Rover's Ranch almost since Day One. We watched as the physical complex evolved over the years into a state of the art complex governed by the comfort of the dogs. Kathryn and Patrick are always making tweaks to the layout to make it even more efficient. What has not changed is the love that they show for each and every canine who comes to visit. Both of them have excellent rapport with the wide variety of canine personalities. Kedar (Mr. Social) has such a blast playing with the other guests. He makes new friends each visit. Scooter (Ms. Not-So-Social) ignores the other dogs, but adores Kathryn and would follow her anywhere. It is wonderful to go on vacation guilt-free knowing that our dogs are safe and comfortable. Photo of Kedar by his owners. Photo provided by Marti Darling. I have a multi-dog household. I have had three to eight dogs in my household for 18 years. That makes traveling difficult and complicated. 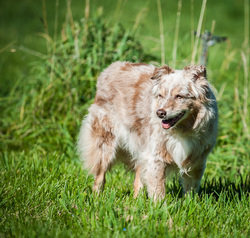 Of the nine dog boarding businesses I have experienced over the years, Rovers Ranch earns 5 stars out of a 5 star rating with me. My dogs are happy to be dropped off. They are happy when I come to pick them up. Any medications or feeding preferences I have is no problem at Rover's Ranch. They are flexible with pick ups and drop offs and they will go the extra distance to make sure your canine friend is happy during their stay. You know when you approach Rover's Ranch because the dogs are excited to be there. You can see it when the dogs greet Patrick and Kathryn. I am a real dog fanatic and the knowledge and expertise regarding dog behavior and care is expert. I drop my dogs and enjoy my trip. I know my dogs are in good hands. Let us know what you and your dogs think!